On February 4th, I blogged about A Most Anticipated Book of Spring 2015: About the Shroud of Turin. Publishers Weekly had picked a fiction book about the Shroud of Turin as one of The Most Anticipated Books of Spring 2015. 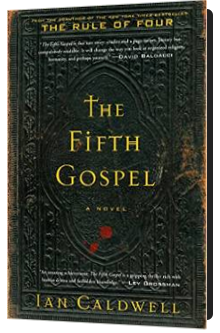 The book was The Fifth Gospel by Ian Caldwell. At the time, I said the book would not be available until the middle of March. Well, I was wrong. You can buy it, starting today, in Hardcover, Kindle and Audible. The novel’s genesis traces to 2003, when I came upon the surprising fact that our modern notion of Jesus’ physical appearance – the bearded, long-haired man of Christian art – goes back to about 400 AD, before which no one seems to have agreed what Jesus looked like. The Bible offers no description, so where had this image come from? Around the same time in history, mysterious relics appeared in the Christian East, purporting to be divine portraits of Jesus not made by human hands. In 1978 a British scholar proposed that the cloth we know today as the Shroud of Turin might in fact be the most famous of these early relics: an image widely known and revered in early Christendom. Even though carbon-dating tests declared the Shroud a medieval fake almost 20 years ago, millions of faithful continue to travel to Turin during the Shroud’s periodic expositions, making this single cloth more popular than any museum on earth. Increasingly, they share a conviction that today’s Turin Shroud is indeed that celebrated relic of times past. Is it possible, then, that the Shroud is the most influential image in Christian history? That, when it first emerged, it was considered so authoritative that all subsequent images of Jesus can be traced to it? In the years that followed, I would buy 600 research books on the Vatican, all of them aimed at solving one question or another in this way. The books would arrive at my door from almost every country in Europe, including the Vatican itself. My private obsession to know the history and appearance of every building within the pope’s walls, and as much as possible about the important rooms within them, provided a welcome distraction from the harder work at hand: understanding what Catholics believe about Jesus. For, in order to do that, I could no longer rely just on books. Today, looking back on it, the terror of reaching out to my first priest seems overwrought. In the time since that first interview, I have traded phone calls and emails with Holy See diplomats, Vatican priests, Church lawyers, the wives of Eastern Catholic clergy, the Jesuit former editor of America magazine, and the papal caretaker of the Shroud of Turin. That first time, though, unnerved me. If he had asked around, Ian Caldwell would,have been put onto Paul Zanker’s work The Mask of Socrates. Zanker is among the top five authorities on Roman art and he shows how the bearded Christ emerges in about 300 in Rome. The book can be found in full online. Of course, despite the massive hype, there are many who have different views about the work of Ian Caldwell as even the most basic research makes clear. Please stop mentioning the results of the carbon-dating done in 1988 saying the Shroud is a Medieval forgery unless you are honest enough to mention Raymond Rogers’ (a member of the carbon-dating team) independent research wherein he said, without much doubt, that the results of the carbon-dating are significantly flawed. The problem with the CNN program and most studying the Shroud is that they have their minds made up before venturing into the fray. Also, take a look at Barrie Schwortz’ comments about the authenticity of the Shroud. Confused people who don’t know how the image got printed (or cannot explain) on the burial cloth of Jesus (or Shroud of Turin) use Controversial Carbon-dating results to prove their claims that TS is a fake.